I've got 3 nos ones sitting in the barn. They don't have the moldings for radio speakers. 150$? Yeah, it is what it is with the bearings. It’s just that I asked and was assured multiple times. The guys owns a fleet, he knows the stuff, just be honest about what you know or don’t. I used a V225 Cat forklift to set it up there. Pulled It ok, despite being a pretty hilly section of 80. So I bought this thing. I called the guy and talked with him, his father had bought it new and they used it occasionally. They supposedly had just gone over it making sure everything was good as the ad had said. Seemed like a real straight up guy, so I sent him a check and parked my truck at his yard on our way to NJ fpr thanksgiving. On the Monday after we met up and transferred the title, no problems. It was all down hill from there, hooked up and only a couple lights, no biggie its old and my wife will be following me anyway. OK, so now no brakes, well I'm empty and my truck has good brakes, is what it is. So we take off, make it 12 with 250 to go and smoke, damn... you can see what I found in the second picture. This was after finding a small shop that was open on the first day of deer, I carry tools, just not enough for tearing off a wheel. So chain up the axle and put some grease in the other wheels. I made it to state college when another starts getting hot. We were 5 miles from the central parts facility of the company I work for, so I drop it off there and we head home. I ran down the following Thursday and retrieved it with my pickup and gooseneck. I tore it apart and got lucky I guess, no real damage to the spindle and I only needed an inner set of bearings. I'm gonna convert it over to oil filled hubs and replace the hardware for the brakes, along with re wiring and re plumbing. The trailer is in really decent shape with almost zero rust and is rated for 60K. It'll work perfect for the few times I want to move a piece of rented equipment from work to home. I wish the owner had just told me the truth about the thing, I would have still bought it just would have hauled it in the first place. What's old is new again. Most cats all use canister type filters now. It lowers their "footprint" by not having all the metal from the spin on type going to the dumpster is what we were told in training. Suprised at this, work ordered an F-450 for a small service truck and it's a 14 week wait for it. Saw it at Slippery Rock materials yesterday and along I-80 getting loaded today. Truck looks damn good. It's nice to see something other than the standard Pete or KW. Very nice work you should be proud. King pin progress today. It fought me but I kept at it. Ready for assembly. Just did mine last weekend. I had to replace the adjuster nut on mine as well, as the threads peeled off it. Thankfully the bad thread on the spindle was at the bottom and could be cleaned up. I've got a 98 E7-350 that is pure mechanical (rod from pedal to govenor) in my RD688 tractor. It is with out a doubt the best cold starting engine I have ever owned. I'm a Cat man for a living, with all the tooling and information needed. i would pass myself, parts are available, but electronics are costly and there are less and less people left that can work on them. The 3116 is the engine with a "Detroit" style fuel system. I love those lil guys, a true mechanics engine. Yup, pulling my lil pup. The two trucks you guys had there are are some well taken care of pieces. They always catch my eye when I pass them on 79. Drove by hauling corn Friday when you guys were taking the bed off. I'm suprised to seee Rodger is selling stuff. In the past he had no interest in getting rid of anything. The 38 does have the heavy duty trunnion stand, I didn't know they offered it in that rating. It is set up with ATAAC, it originally was a tip turbine. I current have a 285 in my 01 RD glider and after hauling grain the last few weeks, I'm ready/need more power. I have a 4vh 350 sitting in my garage looking to be installed. My truck is a triaxle, 8LL, 4.64 rears on 24.5. My question is will the 350 be that much of an improvement? I know to get to the 427 to 454 hp range I have to go electronic. I'm not against that at all, I would love the power, but cruise control would be wonderful for my right knee. So am I going to gain much with the 350 or should I go newer? Thanks for thought and opinions. 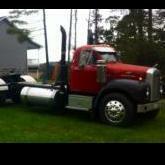 250.00, I'm 6 miles away from the Mack dealer on the same road. I saw you drive by my farm this summer in the truck in your avatar.